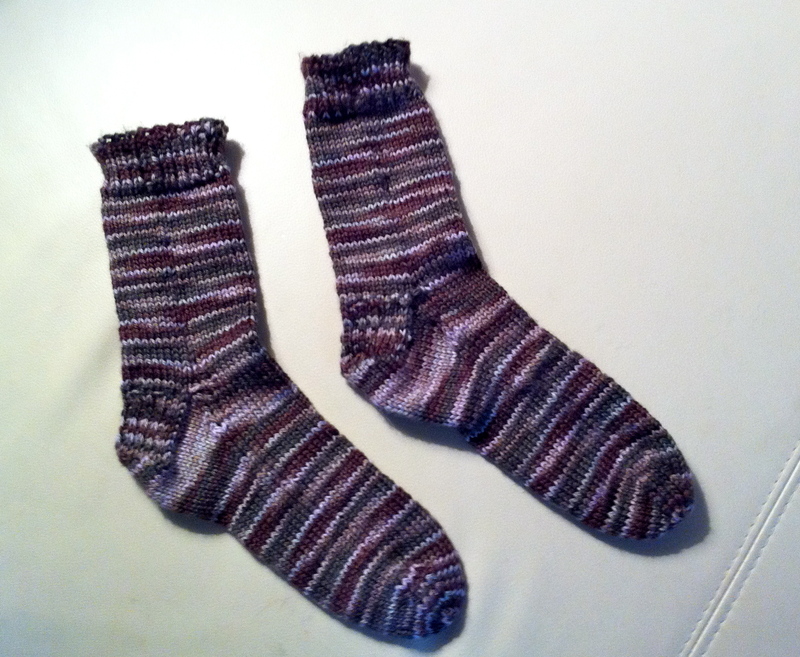 I’m learning to knit socks. 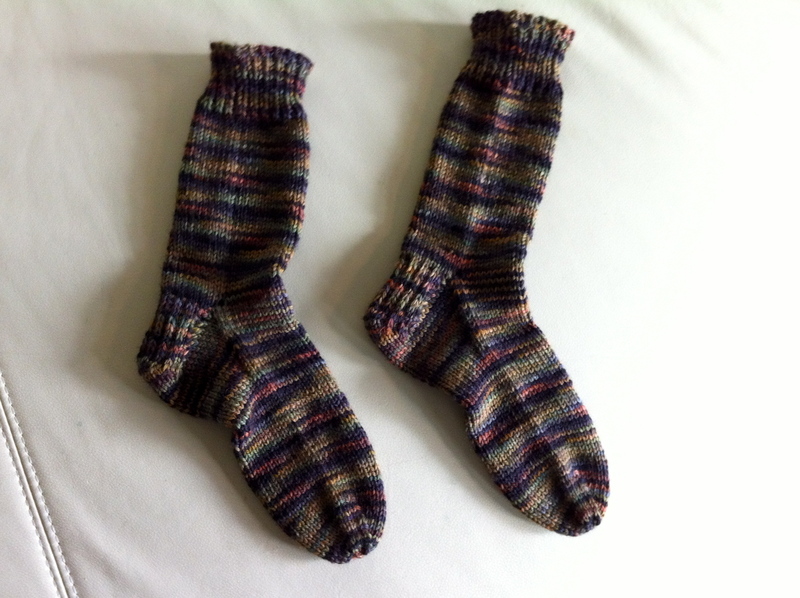 If you read this blog regularly, you’ll recall learning to knit socks is one of my New Year’s Resolutions for 2012. 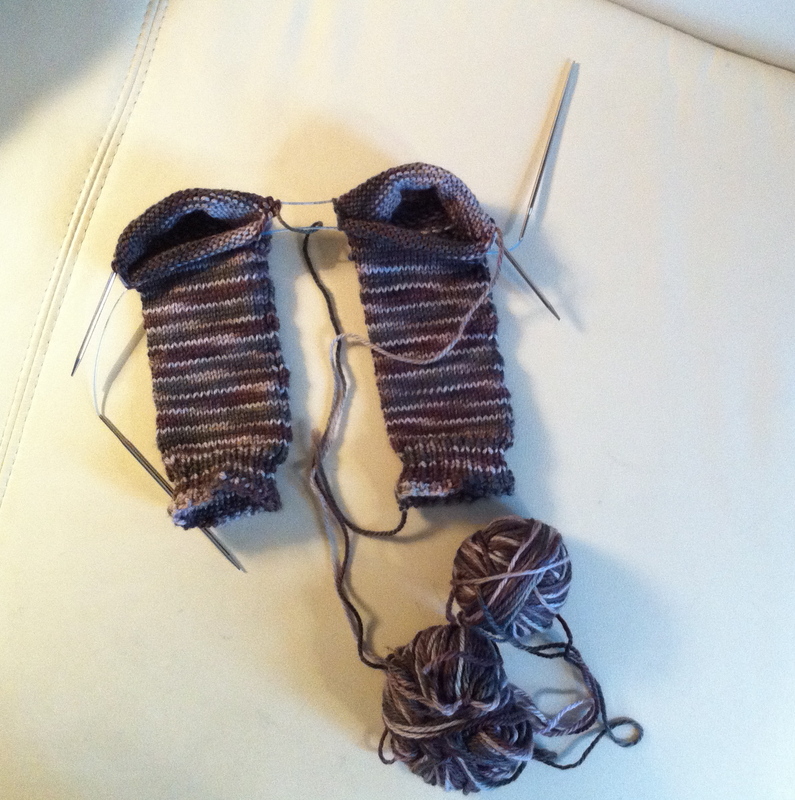 Since I don’t know what I’m doing anyway, I decided to learn the new method of knitting two socks at one time on a pair of circular needles, instead of one sock at a time on a single circular needle. Never mind only a few years ago I defined knitting as: making a tangled mess with yarn and sticks. Hey, I’m a girl who loves a challenge. My audacity stems from years of the “see one, do one, teach one” on- the- job- training mentality most nurses rely on. Fortunately, learning to knit socks two at a time is accompanied by patterns with clear diagrams and photographic illustrations. 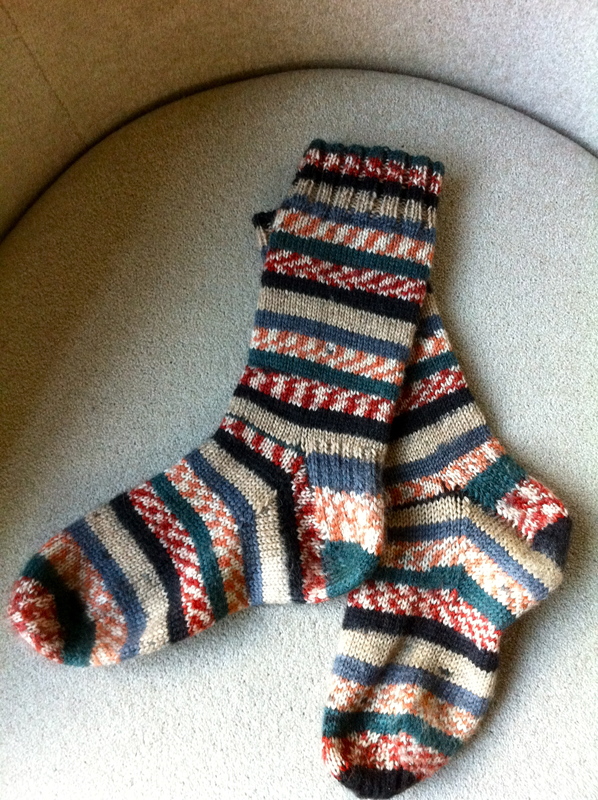 I found mine in Knitting Circles Around Socks by Antje Gillingham (Martingale & Company, publishers). I’m happy to report I have successfully turned both heels. The most vexing problem has been confusing which of the four needle tips to use, then having to rip out and knit again previous rows after doing it wrong. I found one dropped stitch too, which is so far back at the beginning there is no way in hell I will rip out my work to redo it. I’ll simply learn to live with it. If only nursing mistakes were as inconsequential. Who wouldn’t go back in time and fix the med error, rephrase the statement that made you sound dumb in front of coworkers, or treat differently the symptom, which turned out more significant than you realized at the time? Wouldn’t it be great if we could rip out our mistakes and knit them again like stitches dropped from a pair of needles? Instead, I am aware of the importance my words carry when patients come to me with concerns or fears. I answer the same questions multiple times over the years of my career, but for the patient, their fears are new. For everyone, I hope to get it right the first time: the right amount of compassion, the right understanding of the meaning of their words, the right kind of wisdom needed for a particular moment. If I get it wrong, coming across as abrupt, disinterested or intensifying fear rather than calming it, there is no going back to rip out stitches from the fabric created by my words and actions. They hang in our memories like dropped stitches; leaving an unsightly hole. Nursing is more complex than knitting two socks with four needles. Often, there’s no way to go back and fix our mistakes. Sometimes the best we can do is learning from errors, acquire the necessary grace, and live with the resulting holes in our socks. *Update: I finished knitting my first pair of socks last night. See photo. It was a quiet New Year’s Eve in our home, as I worked the next day. It’s okay, because I’ve heard what you do on the first day of the year sets its character. With several hospitals in town looking at staff lay offs, I’m grateful. I wore a pair of wool socks inside my nurse clogs, knitted and given to me by my mom. They inspired me to write, “Learn to knit socks” on a Post-It note, and add it to my Mason jar of goals and dreams for 2012. Another hastily written, last-minute Post-It note reads, “Research and purchase a case of Oregon Pinot Noir.” I am an accidental wine enthusiast (another post). I may have to work an overtime shift to accomplish it, unless of course, I am a casualty of the layoffs. 2012 is a year of uncertainty, waiting to learn if the economy will improve, or if the other shoe hasn’t yet fallen. I remain cautiously optimistic; I believe the opportunity for things to improve is about the same as for things to go wrong. Surprised by joy is a possibility. So, I’m wearing the wool socks my mom lovingly knitted, put one foot in front of the other, and begin the journey that is the year 2012. Craft is remembering that art is seen, felt and heard as well as understood, knowing that not all ideas start with words, thinking with hands as well as head. I wasn’t there to shop for yarn or knitting projects though. 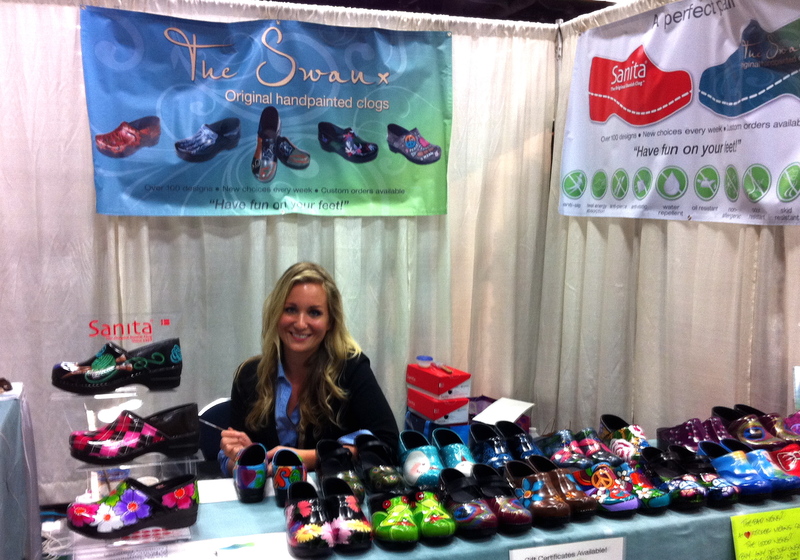 I was there to meet Kira Chelemedos, an artist who hand paints clogs for The Swanx, a Washington business owned by a nurse, Shawna Johnson, and her husband Curtis. Kira begins with a pair of leather clogs, and custom paints virtually any design a buyer wants, including portraits of pets, children, or grandchildren. The paint is sealed onto the leather, and waterproof. The Swanx website features many original designs by artists if you aren’t interested in designing your own. I tried on a pair of open back clogs and was surprised to find non-slick inner soles. I have narrow feet with high arches; when I wear open back clogs my feet slip out backwards and I hit my instep on the back of the shoe, which hurts like hell. The non-slick inner soles of these clogs prevent that from happening. The pair I wanted was already sold in my size, so Kira and I discussed the idea of sending her a jpeg of one of my paintings for her to copy onto a pair of open backed clogs. It costs a little more for a custom design, but how cool will it be to wear my painting on a pair of shoes? Afterwards, I toured the other vendors’ booths. I can knit. 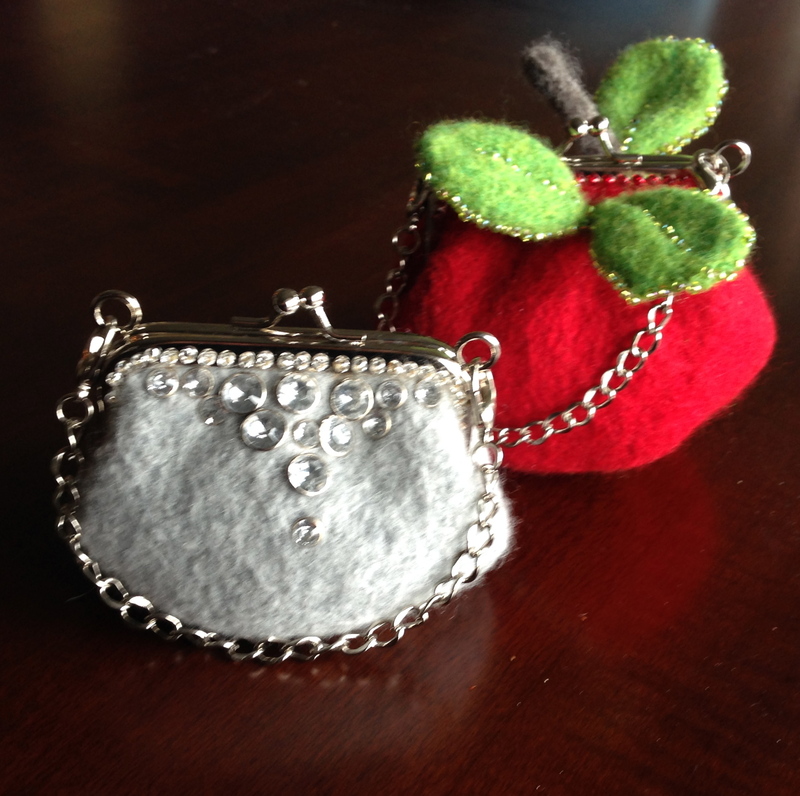 I have made several sweaters, (which I actually wear), scarves, and felted handbags. I’ve also knitted wire bowls, which I’ve exhibited in a gallery, and sold from my studio. I do not consider myself a knitter, however. 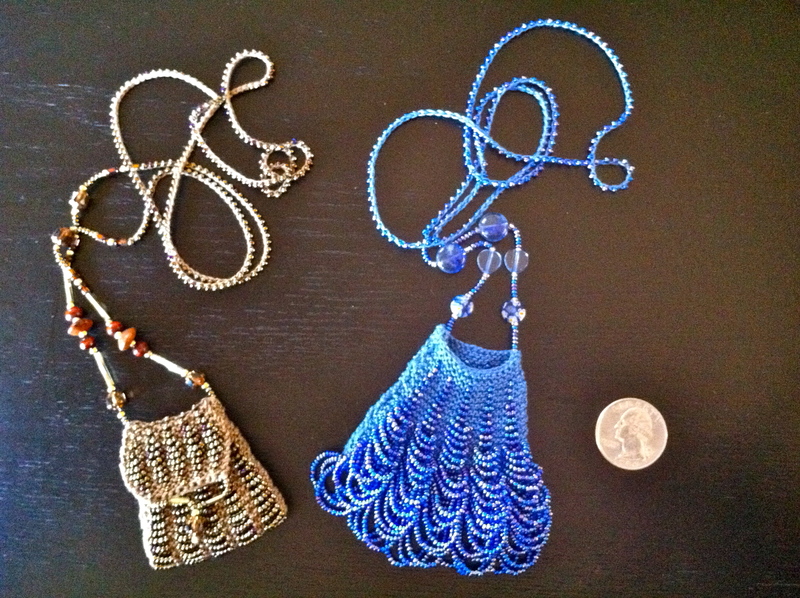 My mother is a knitter, and by that I mean she can make anything from a long, continuous strand of yarn: tiny, beaded Victorian purses to hold an amulet and wear around your neck, scarves that look like lace, prize-winning christening gowns for babies, and well, socks. It’s rare to see my Mother sitting without knitting needles clicking between her fingers. As soon as I entered the conference room full of vendors selling hand spun and dyed yarns, and knitting paraphernalia, I wished my mother and I lived in the same city so we could have shared the experience. Note: I did not receive payment or reimbursement, either financial or in product from Sock Summit or The Swanx for this post . The information above is my opinion.